National Child Passenger Safety Week is September 23-29, 2018, but Bump Club and Beyond teaches and preaches proper child passenger safety all year long. 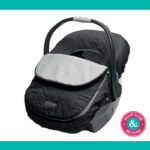 You can find us providing safety tips at ALL of our Gearapalooza: The Ultimate Baby Gear and Registry Events, BCBasics for Target: Registry 101 events, as well as many other events across the country. In the past we’ve jazzed this week up with fancy giveaways from many of our car seat partners, but this year we’re keeping it simple. Keeping you and your families safe and protected is our number one priority. In 2016, among children under 5, car seats saved an estimated 328 lives. 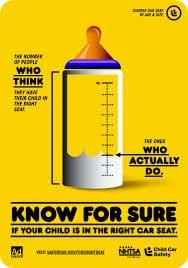 A total of 370 children could have survived if they had been buckled up 100 percent of the time. 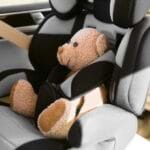 In passenger cars, car seats reduce the risk of fatal injury by 71 percent for infants and by 54 percent for toddlers. For infants and toddlers in light trucks, the corresponding reductions were 58 percent and 59 percent, respectively. Most parents are confident that they have correctly installed their child’s car seat, but in most cases (59%) the seat has not been installed correctly. According to NHTSA data, in 2015, about 25.8 percent of children 4 to 7 were prematurely moved to seat belts, when they should have been riding in booster seats. Stay tuned to the BCBlog for more safety tips for Child Passenger Safety Week. Make sure to book mark these so that you can reference them in the months and years to come.